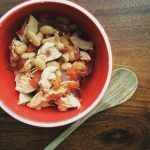 An easy yet elegant dinner that takes 30 minutes to make. 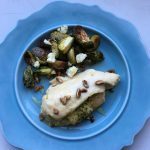 Pear and Blue Cheese Stuffed Chicken Breast with Brussels Sprouts is an easy one-sheet dinner perfect for weeknights or special occasions. With a sharp knife, cut each chicken breast horizontally down the middle, but not all the way through. Open the chicken breast so that there are two sides open. On one side of the chicken breast, layer the pear slices, Blue cheese, and shredded Brussels sprouts. Pull the other side of the open chicken breast over the stuffed side. Place the chicken breast on a sheet pan. Drizzle with olive oil and set aside. In a medium-sized bowl, combine olive oil and Brussels sprouts. Brussels sprouts should be well-coated. Layer Brussels sprouts on the sheet pan alongside the chicken. Sprinkle with salt and pepper. Place the chicken and Brussels sprouts in the oven. Cook for 20 minutes or until liquid from chicken runs clear. Once the chicken and Brussels sprouts are removed from the oven, drizzle the chicken with pecan pieces and honey and the Brussels sprouts with remaining blue cheese if desired. Serve and enjoy!